Join us for the 17th annual Bassoon Day at McGill! This year’s special guest is Ted Soluri, the principal bassoonist of the Dallas Symphony Orchestra. Bell Bassoons Ltd (Canada) and Fox Products Corp (USA); coffee will be served. 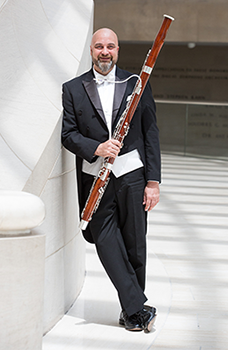 Ted Soluri became the principal bassoonist of the Dallas Symphony Orchestra in 2015. Prior to his appointment, he held the same position with the Milwaukee Symphony Orchestra from 2004-2015 and the Santa Fe Opera from 2007-2015. Mr. Soluri has made numerous concerto appearances, including in works by Mozart, von Weber, Ferdinand David, Richard Strauss, Michael Daugherty, and Haydn. Mr. Soluri has also performed recitals and concerti at various International Double Reed Society conferences at Ball State University, The University of Oklahoma, Arizona State University, and Lawrence University. In 2017, Mr. Soluri was thrilled to release his debut CD entitled Sempe Libera. The recording includes opera arias played on the bassoon and stemmed from Mr. Soluri’s great love of the voice and operative repertoire specifically. The recording has received high praise and is available on Amazon, iTunes, and Spotify. Mr. Soluri begins a teaching post at Southern Methodist University in the Fall of 2019. Additionally, he taught at the University of Wisconsin-Milwaukee, and the Chicago College of Performing Arts at Roosevelt University while living in Milwaukee. Mr. Soluri has also given master classes at The Florida State University, the Eastman School of Music, Ball State University, The University of Wisconsin- Madison, Lawrence University, the New World Symphony, and the Glickman-Popkin Bassoon Camp. Alexandra Eastley recently moved back to Montreal where she is playing Second Bassoon with the Orchestre Symphonique de Montréal for the 2018/19 season. Previously, she was Principal Bassoon of the Winnipeg Symphony Orchestra from 2007 to 2018. Alex began her Bachelor of Music degree at the University of Toronto with Nadina Mackie-Jackson and completed it at the Curtis Institute of Music with Bernard Garfield. She earned her Master's degree in solo bassoon performance from McGill University where she studied with Stéphane Lévesque. From February through June, 2016, Alex was guest Principal Bassoon with the Auckland Philharmonia Orchestra in New Zealand. She has also performed as guest Principal Bassoon with the Calgary Philharmonic Orchestra, the Scottish Chamber Orchestra, the Ulster Orchestra, the Royal Philharmonic Orchestra and the Hallé, and as guest Assistant Principal Bassoon with the Royal Scottish National Orchestra and the Atlanta Symphony Orchestra. In the realm of improvised music, Alex has played with the London Improvisers Orchestra (UK), the Dutch Impro Academy in Amsterdam, Vitamin-S in Auckland, and at the Audio Foundation in Auckland. Inheritance, an album of improvised music recorded with her group Civvie, was released in 2017. In addition to teaching privately, Alex teaches during the summer at the International Music Camp at the International Peace Gardens and the Curtis Institute of Music Young Artists Summer Program in Philadelphia. She has served as sessional instructor at the University of Manitoba and Memorial University, and was on faculty at Brandon University from 2014 to 2018. Advance registration is required; please sign up here!